Many shoppers who wished to avoid Black Friday shopping made their way to the Holiday Market — open from now until Dec. 23 — as a more relaxed alternative. WASHINGTON — Instead of braving the crowds at the department stores this weekend, how about sipping hot chocolate, listening to live music and browsing dozens of unique shops? You can because the Downtown Holiday Market is back. Many shoppers who wished to avoid Black Friday shopping made their way to the market as a more relaxed alternative. “I think it’s a lot better because no one is trying to kill someone over a TV,” said Paige Perry, of Norfolk, Virginia. Mother and daughter Kim and Colina were picking out a painting in one of the booths, laughing and saying the market was a much better way to shop than the mall. Monaco said she looks forward to the market every year. Within minutes of arriving, she had already picked out a few gifts. 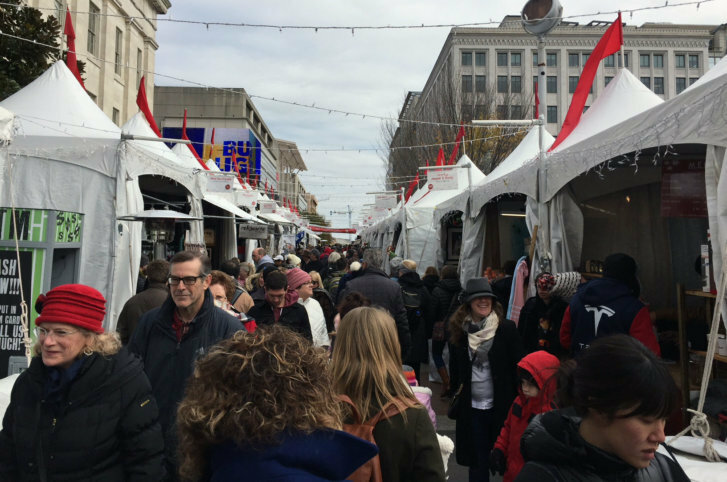 The D.C. Holiday Market features more than 150 regional artisans, craftsmen and boutique businesses, a fact not lost on Jennifer Barnhardt. “We like more of the handmade things you can’t get in the regular store. Something unusual,” Barnhardt said. If you’re thinking it’s too cold to shop outside, heaters are set up throughout the area and vendors sell hot chocolate and coffee. The Downtown Holiday Market is open daily from noon to 8 p.m. until Dec. 23. It’s set up on the corner of 8th and F Streets, right outside the Smithsonian American Art Museum and the National Portrait Gallery. It’s also a different marketplace every day, literally. The selection of exhibitors rotate daily.